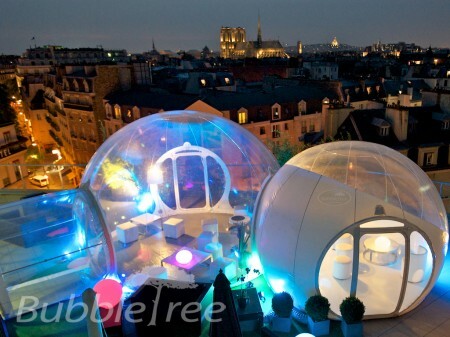 Transparent or white, it is designed to equip the Bubbles of 3,3m in diameter. The standard complete 3,3 m ensembles are offered with this module. Transparent or white, it features two removable dividers with the doors. Magnetic doors can be installed to optimize circulation of people. Transparent or white, it features three removable dividers with the doors. This passage allows you to create multiple combinations of the Bubbles. It can link 3 spheres or modules, or 2 elements allowing the entrance wherever you like. 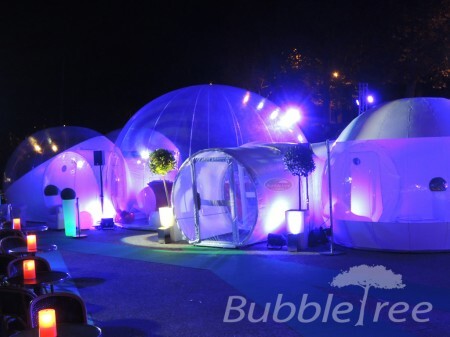 Whatever your event project, scenography and functional requirements are, the BubbleTree Event spheres connect to each other to easily and rapidly create additional space. Configurations are almost infinite; adapted to each event they guarantee unique installations fitting the client’s needs. The modularity principle thus allows interconnection of all the elements of the BubbleTree Event range. Use our 3D Configurator to create your exclusive event space. 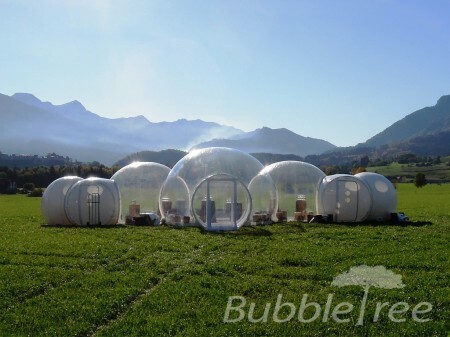 The Bubbles are equipped with various elements depending on the configuration and conditions of installation. Air blower: The Bubbles are equipped with low power consumption turbines (55 – 97W). They are plugged in, or can function from a battery. Solutions allowing energy self-sufficiency are available; please consult BubbleTree for more information. Power inverter: Inverters (autonomy and security units) can ensure the autonomy of the turbines up to 17h. Modular wooden floor: The wood CTBX is resistant to permanent humidity (optional, recommended for nomadic installation without using a terrace). Dividers: The openings of the spheres and the modules of entrance can be closed or separated by transparent or opaque dividers. These elements can be with or without a door, and numerous versions and adaptations are available. Heating system: Blowers or professional heating system are available. Air conditioning: Air-conditioning system or sunshields can be used. For the «thermal shield» option please consult BubbleTree.